Do you regularly find yourself with bad breath throughout the day? According to your dentist in Bixby, your at-home oral care routine can have a large impact not just on the overall health of your mouth, but how it smells as well. Bacteria is constantly harboring in the mouth, so it’s important to confirm that you’re taking all the necessary steps to curb your bad breath in between visits. Today, we’ll be discussing why flossing matters and how it can help reduce your bad breath. If you already brush twice a day with a fluoridated toothpaste, then you’re already on the right track. However, did you know that brushing only removes about 65 percent of plaque and food debris from the surface of your teeth? This is because the bristles are not able to reach the deeper pockets of your gums nor the sides of your teeth. This is where daily flossing comes in. When you floss, you’re able to remove the remaining 35 percent and keep decay at bay. When plaque is present in your mouth, it can still produce a foul odor, especially when you consume foods and beverages throughout the day. If you’re ever unsure if you have bad breath, lick the back of a spoon and wait a few minutes. If the spoon smells foul, then your breath is too. 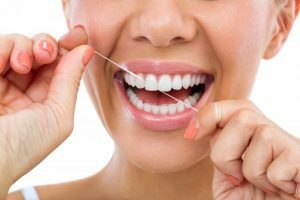 With effective flossing comes proper flossing technique, so let’s break down the right steps to flossing effectively every time. First, start by pulling out about 12 to 18 inches of floss at a time. This way, you’ll have enough to wrap around both your index fingers. Then, gently thread the floss in between each of your teeth and slide it back and forth. Make sure you don’t accidentally snap the floss in the process as this can damage your enamel. Finally, unwind the floss from your finger to access teeth deeper in your mouth. If you struggle to do this, consider purchasing handheld floss picks. These are also ideal for removing food and plaque that build up throughout the day. Floss also comes in refreshing flavors like mint to help your bad breath. Are you drinking plenty of fluids throughout the day? Dry mouth allows bad breath to flourish, which is the same reason “morning breath” is a thing. Consider purchasing a mouthwash specifically for killing bad breath. These alcohol-based mouthwashes can be more intense, but they are more likely to kill bacteria that causes bad breath. Visit your dentist for an examination. If you don’t know why you have bad breath, your dentist should be able to help diagnose and treat the cause. Have more questions on reducing bad breath? Schedule an appointment with your family dentist in Bixby today! Dr. Parnam Mohanna is just as prepared to help you improve your at-home oral care as he is to provide preventive dentistry. His techniques will keep your oral health in top condition for years to come. To learn more about his practice, contact your dentist in Bixby through his website.